On April 24, Toray Plastics (America) Inc. (North Kingstown, RI) President and CEO Mike Brandmeier along with Rhode Island Governor Gin Raimondo, University of Rhode Island (URI) President David M. Dooley, College of Engineering Dean Raymond Wright, and College of Engineering student Kalvin Cho broke ground on the construction of a $125-million engineering complex at URI. 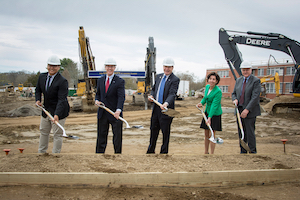 Breaking ground for the $125-million engineering complex are (left to right) URI College of Engineering student Kalvin Cho, Toray Plastics (America) President and CEO Mike Brandmeier, URI President David M. Dooley, Rhode Island Governer Gina Raimondo, and Raymond Wright, Dean of the College of Engineering. In 2014, Toray Plastics (America), a subsidiary of Toray Industries Inc., pledged $2 million for the project contingent on the passage of a bond referendum, which Rhode Islanders overwhelming approved in November of that year. The project will produce a 190,000-square-foot facility designed to foster interdisciplinary collaboration to meet technology-driven changes in all sectors of engineering. This first phase of the transformation of the engineering facilities marks the largest construction project in the university’s history. It is set for completion in the summer of 2019. The new building will house seven of the eight university engineering programs: Biomedical, chemical, civil, computer, electrical, industria, and systems and mechanical. Toray’s gift grants the company naming rights for the atrium of the new building. In addition to the pledge, Toray has contributed $2 million in gifts to URI’s College of Engineering, primarily supporting the Toray Plastics (America) Engineering Fellowship and scholarships for undergraduate students. The company also offers internships and sponsors special engineering design projects for students to pursue during their senior year. Toray Plastics (America) is a manufacturer of polyester, polypropylene, bio-based and metallized films for flexible and rigid packaging, lidding, industrial, optical and electronics applications. The company is also a leader in the manufacture of polyolefin, polypropylene, and polyethylene foams for the automotive and flooring industries.